After that amazing time on the sea, Ms Hotness and I headed south. 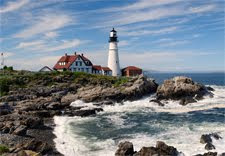 We drove toward Portland, but then took an exit heading to Cape Elizabeth, which is really in the coast. There, we found the Portland Head Lighthouse which is one of the oldest lighthouses here in the state. It was made in 1791, and it was directly ordered to build by our first president, George Washington! First, they use whale oil, but as technology progressed they went to lens and then to a beacon, which they can see 24 nautical miles away! While we were at the lighthouse, I asked the gift-shop lady to tell me which is the best lobster restaurant in the area. She grab the map and then pointed me to the south to a town in the coast called Ogunquit. I put the direction in my phone's GPS and headed there. The place is called Barnacle Billy's and they have an area where you can sit outside. and it is beautiful. We have our huge blanket from the lighthouse, and stop to buy a bottle of wine in the liquor store. We seated outside by the car overlooking the coast, and what a view! the sunset, dinning with this gorgeous woman, it cannot get better than this!! We started with a warm and tasty home made clam showder, then we build our own surf and turf. we bought the famous delicious Maine Lobster and a New York Sirloin steak. All i can say is that we lick our fingers and then kiss the night away! Anything that happen in Maine stays in Maine! This was an amazing place, and there was more that happened during our mini-vacation, but that will be for another blog!